Since New Orleans lacks the hilly terrain necessary to run the gravity-powered Soap Box Derby cars|! !| races were held on area overpasses such as the Wisner Boulevard one pictured here. I am a native New Orleanian, age 71. I can recall, as a child, watching the Soap Box Derby car races held at the overpass on Wisner Boulevard near City Park. Can you tell me anything about these races? What years were they held? Who sponsored them and what were the criteria for entering into the races? What kind of prizes were awarded to the winners? Were there regional and national races? If so, did a New Orleans entrant ever place or win in the nationals? Can you describe a typical soap box car? The cars were not powered with engines, but depended on gravity for speed. With the flat terrain in New Orleans, it seems the races would have been limited to overpasses where there would be enough slope to make the race exciting. Racing of gravity-propelled homemade race cars originated in Ohio in the early 1930s but took a while to catch on in New Orleans. From the ’50s to the ’70s, New Orleans’ annual Soap Box Derby was a major annual event sponsored by local Chevrolet dealerships, the New Orleans Recreation Department (NORD), the New Orleans Item newspaper (and its successor, the States-Item). Both a national cheating scandal and the loss, in ’72, of Chevrolet’s corporate sponsorship, contributed to a sharp decline the sport experienced after the early ’70s. The name “soap box derby” hails back to the time when the homemade racers were cobbled together from used detergent crates. Starting in 1950, NORD, Chevrolet and the Item newspaper sponsored an annual Soap Box Derby. Since New Orleans lacks the hilly terrain necessary to run the gravity-powered cars, the races were initially held on the Franklin Avenue and Broad Street overpasses until finding a permanent home, in ’56, on the recently completed Wisner Drive overpass along Bayou St. John. Initially open only to male participants between the ages of 11 and 15, the event later permitted girls to compete. The teens were required to build their own cars, using kits they obtained from Chevy dealers. Adults could offer advice but were strictly forbidden to partake in the actual construction process. 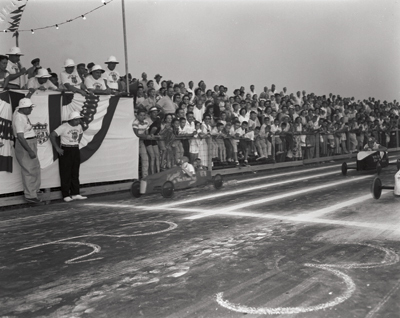 The local 1956 Soap Box Derby, held in mid-July, attracted 130 participants and an audience of 10,000 onloookers. Otto Poitier, age 15, won the competition and the opportunity to compete in the national Soap Box Derby finals in Akron, Ohio; his prizes included a trophy, a tool kit, a camera and a cake. Youngsters who progressed to the national championship competed for academic scholarships. My cat William, aka The Judge, would like to know about a building on Euterpe Street near Carondelet Street. It somewhat resembles the old synagogue around the corner. Do you know anything about its history or original use? Sorry M. L., but we have a strict editorial policy against responding to questions from cats. If we answer one cat’s question than we’ll have to answer all cats’ questions. Then what happens when the dogs start kicking in? In addition, Poydras has many inquisitive parrot friends plus a nosey cockatoo or two. We just can’t do it. However, since you seem like a nice person we’ll answer the question, but just this once. Congregation Beth Israel, an Orthodox synagogue established in 1904, found its first permanent home when, two years later, it moved into a mansion at 1616 Carondelet St. Last owned by New Orleans mayor Joseph Shakespeare and once home of the Sylvester Larned Institute, an acclaimed institution for the education of young women, the building soon proved too small for the growing congregation and was demolished in the early ’20s. A new sanctuary, designed by architect Emil Weil, was erected on the site. Congregation Beth Israel’s new synagogue was formally dedicated in September ’24. In 1926, Congregation Beth Israel erected an annex around the corner at 1629 Euterpe St. Known as the Menorah Institute it was, like the synagogue, designed by Emil Weil. The new addition was a multi-purpose social and educational center, containing a social hall, classrooms and offices. I remember the neutral ground along Canal Boulevard used to be far more elaborately landscaped than it is now. Do you remember the old sunken gardens or know when they were first installed? Extending from Weiblen Place to the Lake, the once-magnificent sunken gardens began as a $1 million Works Projects Administration (WPA) project, the first phase of which – a section near the Homedale intersection – was completed in 1937. Albrizza mimosas lined the sides while yellow iris adorned the low parts in the middle. As Lakeview developed on recently drained reclaimed land, the sunken gardens were seen as a practical and attractive solution alternative to continually draining or filling in the drainage canal that once ran down the middle of the thoroughfare. Rose gardens, which the New Orleans Floral Trail, Inc. planted in the sunken gardens, further enhanced aesthetic appeal of these public plantings, which were maintained by the New Orleans Parkway Commission. Within five years of their dedication, Canal Boulevard’s sunken gardens were actively promoted as part of the New Orleans Floral Trail. Municipal budget woes and neglect took a heavy toll on the sunken gardens, which fell into ruin by the early 1970s. In ’86, the city undertook a partial renovation, restoring a portion of the Sunken Gardens between Polk and Kenilworth streets. Unfortunately, for those of us who remember the original sunken gardens, their replacements pale in comparison. How long has Lundi Gras been part of the local traditional Mardi Gras scene? I grew up in New Orleans, but I can’t recall the Monday before Mardi Gras being anything other than a pretty dead day as we geared up for the main event on Tuesday. My parents and grandparents say the same thing. Your memory is right, Lundi Gras as we know it today isn’t an old-time tradition, but a very modern one. In 1987, New Orleans Magazine’s own Errol Laborde, John Charbonnet and other members of the city’s Mardi Gras Task Force introduced the celebration as a way to bring Carnival activity to the riverfront and give people an excuse to remain downtown between Bacchus and Mardi Gras. Combining Rex’s traditional arrival by river with a day full of free concerts, the Lundi Gras experiment was a rousing success that not only caught on but also has endured for more than a quarter-century. Initially just a place-keeper for more popular carnival attractions, Lundi Gras has grown to attract its own merrymakers. During a recent visit to your fair city, I was somewhat startled to see an immense statue of St. Jude looming over the wall next to the chapel of Our Lady of Guadeloupe. I know the chapel is also the International Shrine of St. Jude, but the statue is totally out of scale with its surroundings and surely wasn’t designed for its present cramped surroundings. Just how big is that thing anyway and where did it come from? Brothers John and Robert Liljeberg, both of whom were intensely devoted to St. Jude, purchased the statue in Rome during the summer of 1985 and had it shipped to Louisiana. The work of sculptor Gaetano Dal Monte, the statue was dedicated in late October ’86 as decoration in front of the Liljeberg brothers’ new hospital, the St. Jude Medical Complex located in Kenner at 200 W. Esplanade Ave. Made of solid bronze, the statue stands 15 feet 8 inches tall. When the hospital went bankrupt and changed hands in ’95, the statue was donated to the Archdiocese of New Orleans. It soon found a new home outside its namesake’s international shrine, at the corner of North Rampart and Conti streets. Here is a chance to eat, drink and listen to music, and have your curiosity satiated all at once. Send Julia a question. If we use it, you’ll be eligible for a monthly drawing for one of two Jazz Brunch gift certificates for two at The Court of Two Sisters in the Vieux Carré. To take part, send your question to: Julia Street, c/o New Orleans Magazine, 110 Veterans Blvd., Suite 123, Metairie, LA 70005 or email: Errol@MyNewOrleans.com. This month’s winners are: M. L. Cooper, New Orleans; and Bea Daspit, Slidell. Look for the Julia Street question on “Steppin’ Out,” every Friday at 6:30 p.m. on WYES/Channel 12. The show features reviews, news and features about the New Orleans entertainment scene. Viewers who can answer Julia’s weekly question can call in for prizes. Tell ’em you read about the show in New Orleans Magazine.